The Celestial Empire is an old phrase used in Classical Chinese to describe the Chinese Empire. In the original Chinese writing, the phrase literally reads "Heavenly dynasty" - "Large country", which renders both the size of the country and the fact that the emperor was considered as having directly been mandated by Heaven. 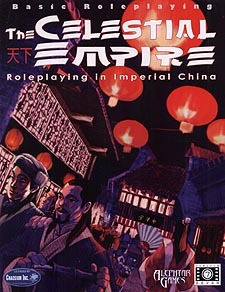 This book is thus a historically accurate roleplaying game about Imperial China. Yet history-based does not mean boring: depending on the game master's inspiration, The Celestial Empire may capture the exotic bewilderment of The Journey to the West, the virile excitement of The Water Margin, the investigative astuteness of Judge Dee, or the kinetic fantasy from Hong Kong fiction!